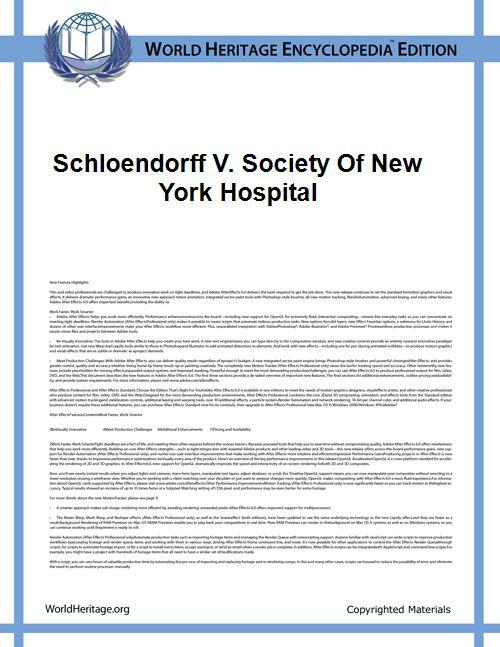 Schloendorff v. Society of New York Hospital, 211 N.Y. 125, 105 N.E. 92 (1914), was a decision issued by the New York Court of Appeals in 1914 which established principles of informed consent and respondeat superior in United States law. The plaintiff, Mary Schloendorff, was admitted to New York Hospital and consented to being examined under ether to determine if a diagnosed fibroid tumor was malignant, but withheld consent for removal of the tumor. The physician examined the tumor, found it malignant, and then disregarded Schloendorff's wishes and removed the tumor. Schloendorff, however, had sued the hospital itself, not the physicians. For this reason, the Court found that a non-profit hospital could not be held liable for the actions of its employees, analogizing to the principle of charitable immunity. The idea that a non-profit hospital could not be sued for actions of its employees became a principle that became known as the "Schloendorff rule." The Court would later reject the "Schloendorff rule" in the 1957 decision of Bing v. Thunig.